Ya know, I'm not a cooked cabbage kind of girl (except in Chinese food), but that looks really good. And since cabbage is $.09/pound at Vons, I think we may be trying this next week. Thanks for the inspiration! I wonder if the kids would eat this since it has the cheese i think I will try it. I've never seen an easier way to make a cheese sauce. I bet it would work in other applications as well. We love cabbage at our house and this sounds like another great way to use it up, even though I can't get it for 9 cents a pound, Fish Mama. Shopannies, I've tried a bunch of cabbage recipes this year in an effort to expand my vegetable consumption, and so far I think this one's my favorite. Hope if you try it, the kids will like it. I am planning on planting cabbage in my garden this year. This will be tasty with fresh cabbage. Thanks Lynn, I personally think the more simple the dish, better I like it! The reason I like simple is because when I spend all day cooking something more difficult, the family gobbles it up in seconds and even if I get a thanks, I wonder if all that time was worth it. Simple dishes allow me to spend more time with my teen and near-teen. They can still eat good and tasty, but I don't have to spend so much time doing prep. Unless the kids want to help with the prep, then it is time well spent!!! Thanks for visiting and thanks for your Blog. Oh, I so love cabbage. And this looks great! We just planted cabbage last week...and this recipe will be put to good use soon! Thanks for posting this one. :) I'm gonna put your website in my sidebar...your recipes are just too good not to share! Umm yummy! I should have made that for dinner! Thanks for visiting our new Hands & Hearts for Him frugal blog and leaving a comment. Hope you'll come again. This looks yummy. I'll have to try it. We like cabbage already. I do not like cabbage, but this recipe really almost makes me want to give it another try! Thank you for visiting me. Congratulations for catching the quilting bug, hehe! :) I would love to see your work. Your blog is so full of yummy stuff... my mouth is watering just reading your recipes. Lynn -- I'm so glad to see this recipe! Years ago, I had a cabbage/cheese casserole at a potluck, but never found out who had brought it, so didn't get the recipe. I think this is it, although the cabbage was cut smaller. Thank you! I found your blog from a comment you left on Book PSmith's blog about Right Ho, Jeeves. I just finished it this morning myself, so your comment caught my eye and I came to visit. Great blog! And yummy recipes! This one really appeals to me because I'm always loking for new casserole-type dishes without a lot of carbs. 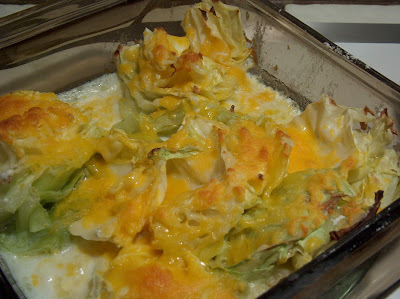 Cabbage and cheese -- yum!